NEW:Click Here to see our NAPA WARRANTY and have piece of mind knowing that when you protect your vehicle by doing recommended fluid services and maintenance your vehicles systems are protected with a nationwide warranty. 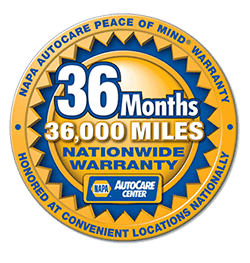 Now at Carmasters Automotive LLC, a 36 months/36,000 mile warranty and 36 month/36,000 Nationwide Warranty! If you are more than 25 miles away from our shop where your vehicle was serviced, call 800-452-NAPA (6272) for more details. If you are within 25 miles of us give us a call and we’ll be happy to answer any questions you may have. Covers parts and labor on qualifying repairs and services for 36 months/ 36,000 miles. The part fails within the manufacturer’s warranty period. Just ask your CarMasters Service Consultant for more details. 3 Year/100,000 mile Nationwide part and Labor Warranty for most engines and transmissions. Remanufactured and improved! Not just rebuilt! Gas, Diesel and Marine Engines, Transmissions, Front and rear axle differentials and Marine Drives. Use Valvoline in your vehicle and you may be eligible for a Free 300,000 mile 10 Year Warranty! Ask your Carmasters Automotive LLC Service Consultant for details and Warranty packet.